Welcome is a painting by Joy Bradley which was uploaded on January 12th, 2010. 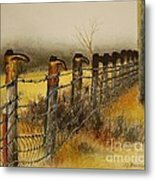 What does it mean to have boots on the fence post? Some say it means welcome, some say in respect of the farmers passing. 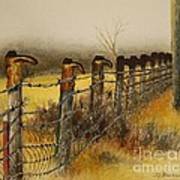 There are a lot of boots on this fence. Holbein watercolor on 140lb Arches watercolor paper. Thank you Sharon for your wonderful compliment! This is a wonderful work . This is a wonderful Wirk. 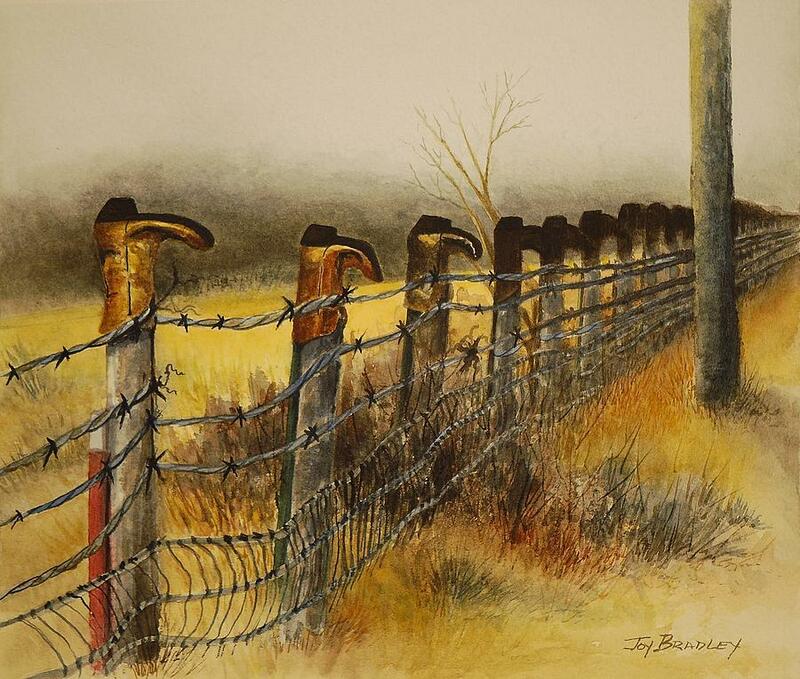 Congratulations on winning second place with your work, in the "Along The Fence Line " contest, March 2019. Wonderful work and well deserved win ! Oh wow! What a surprise! Much appreciated for all the votes! Congratulations! 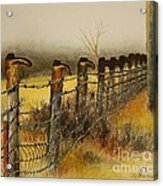 :) You have won ~ Fences Are Fun, 2nd Prize ~ in the "Rural Fences as a Focal Point" contest. Total Qualifying Entries: 476. Thank you for participating. Happy Friday! Thank you much Susan! What a surprise!! This is cool, nicely done Joy! Thank you much for your compliment Linda! Detailed and intricate work...well done.. Thank you much for your compliment! Thank you Oiyee for your compliment and vote!! Much appreciated!! Thank you for your compliment Hazel!! Thank you for your compliment Donna!! What a fun piece, Joy! another one of the traditions with the boot on the fence posts, particularly in rough country, was to have a boot pointing in when the ranchers were home and away when they weren't home to save the visitor from traveling up a long rough road only to find no one home! Hi Mia, Thank you for your take on the boots.....I love hearing different stories on these, they are so fun!! Joy this is outstanding!!!!! I'm an east coast gal, so have never seen anything like this ... a fascinating custom!!! Of course, as always with you, a beautiful work of art ... the perfect composition and tones. I have huge respect for anyone who can make watercolor jump through hoops as you do!!!!! LOVE this!!!! f/v of course!!!! Hi Lois, I was an east coast girl until I moved west!! (Love the cowboys!!). Thank you soo much for your enthusiasm and compliments!! Much appreciated! Yahoo!! Thank you Hazel....It's fun to hear the different meanings. Hi Betty, Thank you for your compliment!! Thank you for looking and reading Carol!! much appreciated!! Thank you for your compliment Laura and your vote!! Thank you David for your gracious compliment! !